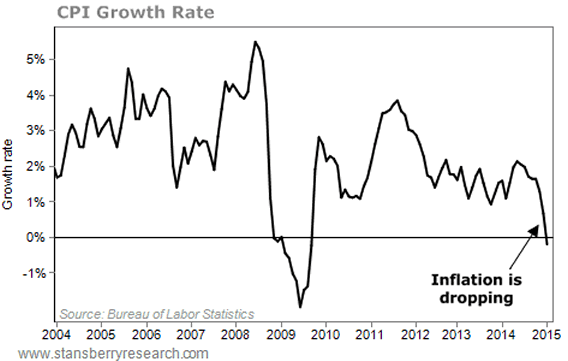 Is the CPI Telling Us the Full Story on Inflation? As I explained in yesterday's essay, measuring the economy is difficult. Very difficult. And in a sense, there are no "real" numbers. But the official measures of inflation, gross domestic product (GDP), or employment aren't the result of some conspiracy agenda. And a close look at GDP data confirms the economy is still slowly recovering from the financial crisis. Today, I'm going to take a deeper look into the "official" story on inflation. And more specifically, I'm going to see if one of the most controversial government statistics – the Consumer Price Index (CPI) – is telling us the full story. 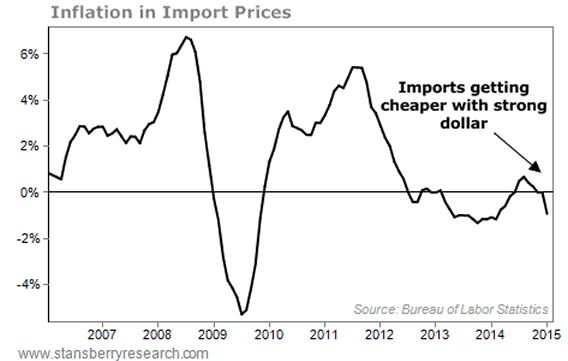 Inflation is supposed to reflect the overall change in consumer prices. But it depends on your perspective whether you think the number is "real." The number most people refer to when discussing inflation is the CPI, calculated by the U.S. Bureau of Labor Statistics. The CPI is designed to reflect the price of a basket of goods and services, including transportation and housing. Some people claim that the CPI has been systematically altered to make it seem tamer than it is. The real challenge when talking about inflation is trying to figure out how much more expensive it is for people to live. That's a hard question to answer. For instance, a home computer in the mid-1990s cost $3,000. Today, you can get one that is 50 times faster for one-sixth the price. Is that deflation? How do you account for the progress in technology? But no matter how you slice it, inflation today remains extraordinarily low. We've already discussed the CPI... Here you can see it's at its lowest point since the 2008-2009 financial crisis. You can see the index declined 0.7% in January. These inflation stats show that things are not heating up. 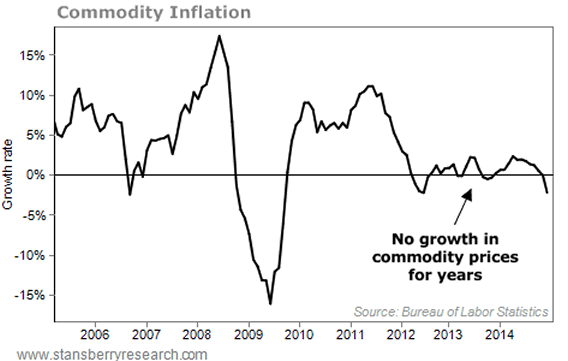 Overall, no inflation means no intervention from the Fed. Which means cheap money and continued rising asset prices. That's why I'm still confident this bull market isn't over yet... and why I'm recommending that my readers continue to buy quality blue-chip, income-producing stocks. Tomorrow, we'll look at another hotly contested government statistic... unemployment. We'll see if the official employment numbers are to be trusted... and check in with my "Cabbie Index" for a real-world view on the job market. P.S. With commodity prices near their lowest point since the financial crisis, it's a good time to buy one of my favorite forms of portfolio insurance... silver. And using a special trick I've discovered, you can get real, hold-in-your-hand silver from nearly any FDIC-insured bank in the U.S... for FREE. You can learn about this loophole and many others in my new Big Book of Retirement Secrets. Learn how to order a FREE copy right here. The DailyWealth Investment Philosophy: In a nutshell, my investment philosophy is this: Buy things of extraordinary value at a time when nobody else wants them. Then sell when people are willing to pay any price. You see, at DailyWealth, we believe most investors take way too much risk. Our mission is to show you how to avoid risky investments, and how to avoid what the average investor is doing. I believe that you can make a lot of money – and do it safely – by simply doing the opposite of what is most popular.